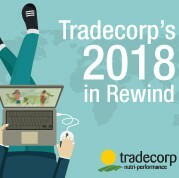 During 2018, Tradecorp not only accomplished its objectives, but went above and beyond. Over the span of 2018, the company, along with the Tradecorp family has grown. Over 100 experienced and well trained members joined Tradecorp this year. This strong team was the key to overcoming all of the challenges that 2018 presented. In June 2018, Tradecorp acquired the Valencian company, Idai Nature which specializes in biocontrol, from microorganisms, botanic and mineral extracts. Idai Nature is highly focused on giving technical service, providing solutions as well as personalized advice for individual crops. They are present in 35 countries, have 3 subsidiaries (Mexico, Algeria and Turkey) and own a factory and 1 hectare trials station in Spain. This year, Tradecorp/Sapec Agro Business also acquired the French company, SDP, whom are experts in adjuvants. These help ensure an effective application of other agricultural products, reducing costs per hectare and eventually maximizing the return on investment for producers. The company is present in over 20 countries, have more than 70 employees and own two factories in France. This 2018, Tradecorp was present in over 40 agricultural fairs worldwide, where our experienced technicians gave advice to visitors on how to improve their crop quality and yield. A few examples of Tradecorp’s international representation can be seen in ExpoAgroalimentaria in Mexico, New AG in Kenya, ABS in China, Interpoma in Italy, Fruit Attraction in Spain, Fenicafe in Brazil, Interpom in Belgium, Agrofuturo in Colombia, IFTF in The Netherlands, amongst many others. In January, Carlos Repiso spoke about stress prevention and the importance of priming at Biostimulants Europe in Valencia, Spain. Marcos Alajarín spoke about the importance of biostimulants at the CNCIC in China. In Kenya, Camila Levy spoke about Phosphorus availability, while José Nolasco spoke about abiotic stress at the New AG International Congress and Exhibition. José Nolasco spoke about the benefits of high-performance biostimulants at Argus FMB Added Value Fertilizers in the United States. Beatriz Leube spoke about “The Action of Biostimulants in Flower and Fruit Setting” at New AG in China. In 2018 we launched 14 products. Most of these are personalized for specific countries and were developed in close collaboration with our clients and local agronomists for an exhaustive and comprehensive understanding of the region’s specific needs. Tradecorp also made a significant investment in research studies, collaborating with over 15 universities worldwide. These institutions, along with the great amount of research centers with whom we collaborate, provide our technical team with trials and in depth scientific knowledge for a deeper understanding of plant physiology and the effect of different solutions and substances in plants. In July, Tradecorp presented IsliFe 8.2, the first biodegradable iron chelate that is stable under alkalinity conditions. The product launch, IsliFe Innovation Forum, took place in Madrid (Spain) located in the dynamic venue, Torre Espacio, one of the tallest buildings in the city. Here, visitors were able to engage with the product through a virtual reality experience, have the product’s details explained by the agronomical and chemical team, as well as witness live debates lead by industry experts from the entire value chain. Over the course of 2018, Tradecorp’s factories went through expansion and enhancements. We increased our production capacity of Phylgreen in Ireland, and the modernization of our facilities in Albacete (Spain) allowed for a 20% increase in the manufacturing of humic acids. In 2018, we also automatized some of our packaging processes and a new lab for the Chemical Development team was built in Sanchidrián (Spain). In terms of regulations, 2018 was the last deadline for the European REACH to be met. The Tradecorp Regulatory team timely registered 30 substances and acted as the leader registrant in seven of them. In addition, more than 50 products were registered in 2018 within 19 countries. In its commitment to Social responsibility, this 2018, Tradecorp has donated to several NGOs. Our team participated in a fitness challenge in which for every kilometer ran, walked or spent practicing a sport, 1€ was donated to the NGO of the winning team’s choice. UNIFEC’s program “Multiplica por la Infancia”, Pyramo, Fundación Adecco and Centro de Apoio Aos Sem Abrigo in Setubal were the organizations that received our donations.